Just because you are unable to shell out a huge capital, that doesn’t mean that you can’t enjoy the pleasurable warmth and comfort throughout the night. Feather duvets, being cheap and affordable, let you to enjoy the same comfort which expensive duvets offer. If your budget is not too high, go for feather duvets. Feather duvets are well known for their splendid warmth and quality comfort. If chilly winter nights provoke you, then feather duvets are awesome choice as it can offer you majestic warmth. The eminent property of feather duvet is that it soaks up moisture and keeps it away from your body. It gives pleasure to continue sleeping dry and cosy all night. 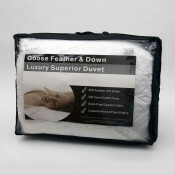 Feather duvets have goose and duck feather as an ingredient and both awards you with fabulous and peaceful sleep. Duck feathers are soft and cosy but goose feathers duvets are far better than duck feather duvets due to its light weight, smoothness and warmth. Goose feather duvets are warmer and expensive as compare to duck feather duvets. So, if your budget permits you, you can surely go for goose duvets as they are ideal for icy winters. Today market is chocked with ample of feather duvet and that too in variety of designs, styles and sizes with wide range of stunning colours. Besides, providing you with luxurious and fabulous sleep, they enrich the decor of your room too. Moreover, while shopping for feather duvets, check the tog rating too. Tog rating gives you an idea about how much warmth it can provide. Feather duvets with higher tog rating gives a fluffy and light weight duvet, and provides you outstanding insulation. Besides having several advantages, feather duvets have some disadvantages too. It is not advisable for those who are allergic to feathers as this can enhance their allergens. People suffering from asthma or having a sinus problem should also avoid feather duvets. Another disadvantage of these feather duvets is its cleanliness. Maintenance of these feather duvets is always an issue. They are hard to handle and are not machine washable as feathers form a clump and become uneven and uncomfortable to sleep. It is advisable to use duvet covers if you go for feather duvets as it can enhance the longevity and keeps your duvet clean too. Fame and Demand for feather duvets has increased tremendously among people due to its low cost and high insulating power. These feather duvets in dazzling hues enhance the decor of your bedroom too. So, next time when you are willing to shop for feather duvets don’t forget to hunt at www.bedingmill.co.uk We have an exclusive range of feather duvet and that too at nominal prices that fits every budget.